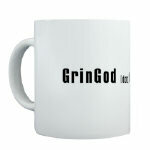 you either didn’t know, or have forgetten, I have an online shop at which you can buy original GrinGod [dot] com products. It may seem like a rather odd thing to buy, but let me tell you, when I am rich and famous, and GrinGod [dot] com is pulling in more hits than Amazon, you can say that you were there at the beginning and you’ll even have the original merchandise to prove it. So what are you waiting for, get over to Shop [dot] GrinGod [dot] com and start buying your heart out.